Read the March 2019 issue of Pharmafocus online now! Just one month to go until Brexit here in the UK, and it’s still all to play for. After months of warning the government over its need for certainty post-Brexit, the pharma and life sciences industries are nonetheless left with little option other than to keep one eye on the daily news and one set of fingers crossed. While the issue seems forever poised to eclipse all other concerns, there is good news elsewhere this month. President Trump used his platform at the State of the Union Address in February to announce the ambitious goal to eliminate HIV by 2030 – a welcome commitment which falls in line with similar pledges from the UK Government and the WHO. He also refreshed his vow to lower drug prices, and promised an additional $500 million investment to children with cancer; you can read the full story on our front page. Elsewhere in the issue, you can also read about the latest research from the University of Edinburgh which has identified over 200 genes linked to depression. The findings could mean big things for the field down the line, and you can read exclusive comment from Professor Andrew McIntosh, the study’s first author, on page 8. In our monthly features, we also delve into the latest R&D developments in the field of cancer, including a technique which turns tumour cells into harmless fat and even the promise from one biotech of a cure for all cancers within a year – you can read all about them on page 20. We also have a full-length feature on the crucial role played by pharmacovigilance in tackling the future’s challenges of uncertainty, while Dan Jeffries shares his remarkable story as one of the few patients in the UK living with not one, but two rare diseases! Read Pharmafocus January/February 2019 edition online now! The September 2018 issue of Pharmafocus is available to read online now! 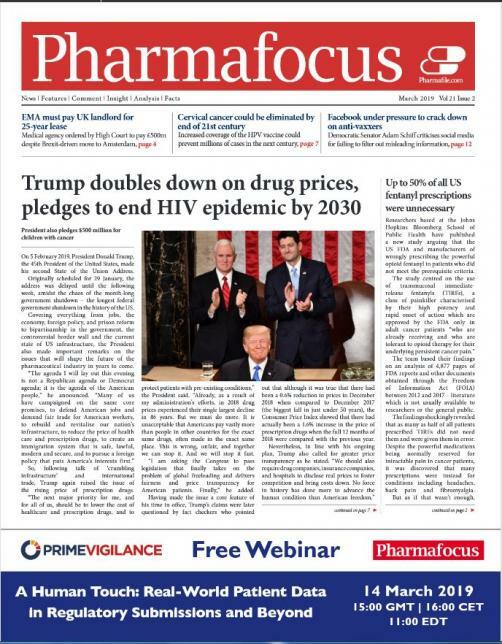 The June 2018 issue of Pharmafocus is now live!